Moomins on the Riviera is willing to be different, so it’s worth your time. I can’t sit here and tell you that I particularly enjoyed Moomins on the Riviera. Not in the usual “I am invested totally in this and believe this world and love these characters and find this entertaining and even somewhat funny” way, in any case. The fact of the matter is that I laughed, in any capacity, about maybe 3 times throughout the entire film, and that I still rather tired of it at about the hour mark of its 80 minute runtime. In the traditional sense, I didn’t really enjoy Moomins. But that said… I do rather like it. If you’ve been following this website and/or myself for the past few years, you’ll know that I get through a lot of animation and, in fact, I make it my mission to see every last one that comes out in cinemas regardless of quality. Therefore, I have seen a lot of mediocre-to-bad animated features in my time, mostly by non-major studios. See, what they, and most foreign animations that get a wide release, fail to do is craft out unique identities of their own. They instead settle for mediocrity and sloppily adhering to formula or just plain copying the more successful companies in the hopes that the successful money will magically roll down to them. Hell, I basically just got done ripping into Two By Two for this two weeks back! Moomins, however, opts to carve out its own distinct identity, refusing to conform to modern animation trends and desiring to be different. Most obviously, there’s the fact that this is a traditionally-animated feature, handled expertly by Sandman Animation, instead of CG. Already this film is in my good graces as I am a sucker for traditional animation, but that alone is not the reason why Moomins looks so great. It is, after all, very simply designed and is mainly powered through limited-animation. Instead, it’s the design and colour of the world that makes that work so. Everything in the film is drawn with such a charming simplicity, from the characters to the environments to the rain to even crowds of people, a lack of extraneous details, that it makes a refreshing change from the busy “everything everywhere all at once” nature of most modern animation. That’s not mentioning the colouring, though, which is the film’s visual trump card. The palette is very relaxingly warm, lots of oranges mixing effortlessly with whites and blues, with clever shading adding definition to the world and differentiating between certain buildings and background characters subtly but brilliantly. It’s a relaxing colour palette, too, that accurately communicates and portrays the low-key soft nature that the film is going for. It builds an identity beyond the fact that it’s traditionally animated, feeling decidedly newspaper comic-strip-y (which is where the characters come from but which I have no prior experience with, I must admit), and the fact that it commits to that simple and rather minimalist nature the whole way through is to be applauded. That low-key identity carries over into the non-visual elements of the film, too. 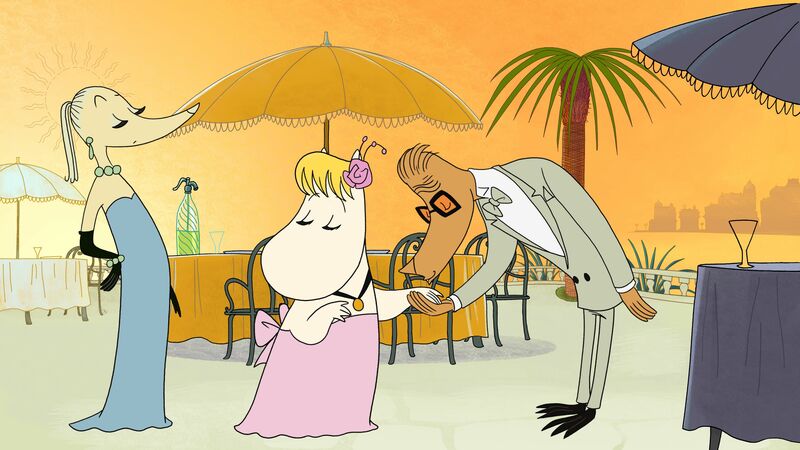 Moomins on the Riviera is very low-key in everything – there’s only one chase, all lines of dialogue are delivered in this consciously soft manner, and the jokes are simple but understated, even delivering physical comedy in an incredibly quiet and deadpan manner. More importantly, Moomins is a weird film. It’s so low-key, so quietly innocuous and deadpan in the way that it delivers its material, that it can flit from everything from the Moomins electing to live on the bed of their large expensive hotel room, to a rich aristocrat who just wants to live like a penniless bohemian artist who only sculpts elephants, to a group of pirates who appear in the film’s first 10 minutes and then are never seen again, and yet still feel like a cohesive film. The tone is so off-beat, so low-key, so deadpan that I have to admit a fondness for it even though I was never really truly entertained by the film – especially since some of its cast, specifically the nasally and massively unlikeable Little My and the unbearably shallow and irritating Snorkmaiden, are far too often not pleasant to watch. The feature-length animation landscape outside of The Big Three – still Disney, Pixar, and DreamWorks until Illumination are able to launch a good non-Despicable Me film – is mostly too generic and interchangeable, filled with soulless imitators or risk-averse opportunists. Hell, even The Big Three have got distinct brands by this point that they don’t try breaking out of enough. To have a film like Moomins come along with such a distinct and off-beat personality, even if it doesn’t quite work for me, is a legitimate breath of fresh air that I have to respect. Therefore, I’m willing to give Moomins on the Riviera a passing grade and recommend you all give it a try. I can’t guarantee that you’ll like or enjoy it, but it is something different and we should encourage different, especially something different that commits totally to and succeeds at that something different, even if it’s not completely to my tastes. Again, I didn’t really enjoy the film, but I do rather like it and it’s unlike most animated fare out there nowadays. Callum Petch has still got a losing streak. Follow him on the Twitters (@CallumPetch) and listen to Screen 1 on Hullfire Radio every Monday at 9PM BST (site link)!